The Wellington Dukes and Prince Edward County hockey fans have been blindsided by sanctions levied by the Canadian Junior Hockey League that will leave the community without an opportunity to host the 2020 Dudley-Hewitt Cup Championship next May. The revocation of the right for an OJHL team to host the Central Canadian Championship next spring is just a number of sanctions levied onto the league after a disastrous roster deadline on Jan. 10. The Hockey Canada roster deadline date has typically allowed for deals between teams of all levels until midnight on that aforementioned date, allowing teams to put together trades to bolster lineups and make moves to help players recognize goals of competing for national championships. Last summer, due to a request from some of the registrars in the various leagues and organizations, the Hockey Canada deadline was moved up to 6 p.m. on Jan. 10 to ensure staffers were not in league offices into the wee hours of the morning on Jan. 11, sifting and sorting through trades and faxed documents. Somehow, the movement of this deadline up four hours didn’t register with some teams in Ontario and a number of clubs, including those at the Greater Ontario Junior Hockey League and the Provincial Junior Hockey League levels, made deals after the new deadline. Players moved to different parts of the province, enrolled in schools and played games before any these infractions were recognized by either the Ontario Hockey Association or the OJHL. The deals made at the GOJHL and the PJHL were allowed to stand due to the fact no teams at those levels will be playing for national championships this spring. However, punishment for the OJHL and its members was meted out and it is severe. And it impacts the Wellington Dukes even though the club had completed all of its dealings well in advance of any deadline. Any player dealt after the deadline may not compete further if their team is the 2019 Buckland Cup champion, meaning the players will not be eligible for Dudley-Hewitt Cup (DHC) or RBC Cup play. Those players are also eligible to become free agents and sign with any club in the off season. The OJHL has been fined $50,000. Finally and perhaps most devastating for the Dukes organization, Prince Edward County and the region (at the very least economically speaking), the OJHL may not host a Dudley-Hewitt or RBC Cup for the next five years. That was extremely tough news for the Dukes because, according to vice-president of hockey operations Randy Uens, the club had received confirmation that Wellington was to be welcoming back the Dudley-Hewitt Cup in 2020 and the team still had eyes on eventually hosting an RBC Cup sometime after that. Wellington last hosted the Dudley-Hewitt Cup in 2014 and played in the championship final, losing 2-1 to the Toronto Patriots before a capacity crowd over over 2,000 fans. “Verbally, we were told just before Christmas and we received a letter on Jan. 3 that said we were awarded the tournament. We still needed to file some paperwork that would indicate we accepted the opportunity but it was ours,” Uens told the Gazette Monday. News of these sanctions and details of the deadline fiasco came to light on Thursday in a story in The Hockey News written by veteran hockey writer Ken Campbell. The team stayed tight lipped about the decision to announce the upcoming 2020 Dudley Hewitt Cup and it was decided by all parties involved that the announcement would come this Saturday when the club hosts the Kingston Voyageurs for a nationally broadcast game on CHCH. 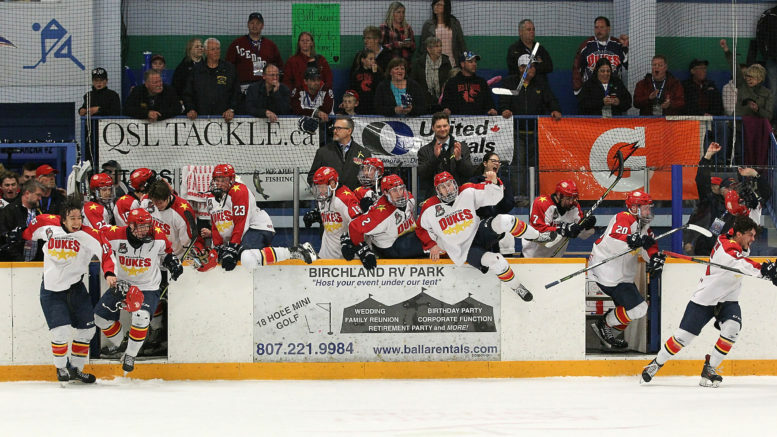 After the new ownership group made some strong claims in the summer of 2017 about hosting a regional or even national championship and then put themselves on the map by appearing in the 2018 RBC Cup championship game in Chilliwack, B.C., the organization was wading with purpose into the waters of elite Junior A hockey clubs. The club worked together with County’s manager of community centres, events and marketing Lisa Lindsay to build and refine a state-of-the-art bid that relied on the tradition of the organization and the beauty of Prince Edward County and Lehigh Arena. Uens said it was designed as not only an DHC bid but as an RBC Cup bid and was well received by the OJHL, who, with the Northern Ontario Junior Hockey League and the Superior International Junior Hockey League, alternately host the annual central Canadian championships. “Once you know you have (the DHC) and there’s a great euphoria about it and then to have it taken away like this is incredibly disheartening,” Uens said. In addition, the club operated at the Jan 10 deadline like a major tournament was coming to Lehigh Arena next spring, especially in light of a impending reduction on the number of overage players a team can roster. In the aftermath, there’s been plenty of finger pointing as to where the breakdown was. According to Campbell’s piece, the OJHL league office should have known of the deadline change as it was made in the offseason by the CJHL and reminders were communicated to all members in November but the OJHL claims the change was not communicated to them. The league appealed the sanctions on the basis that the OHA, the body that handles the rostering of OJHL teams under the Hockey Canada purview, provided conflicting information as to the new deadline. That appeal to the CJHL was ultimately denied. OJHL commissioner Marty Savoy did not return the Gazette’s inquires for further information on the sanctions or the loss of tournament hosting rights. Unfortunately for Wellington, the CJHL bylaws dictate that punishment must be levied upon the leagues and not the team members themselves even though in this case, the sanctions deeply harm the Dukes organization because they had already been awarded the tournament operated as such at the deadline. “The organization is disappointed but we have a whole whack of long time and dedicate volunteers that were eager and willing to host this tournament and it’s going to be very hard for them to try this in five years time. It’s huge loss for the community,” Uens added. UPDATE: On Tuesday, the OJHL issued a media release to clarify their position on the ruling by the CJHL. “At this year’s January 10th Hockey Canada cut down (where team rosters must be officially reduced to 23 players for the balance of the season), an issue occurred in the communications with teams within both the OJHL and the OHA with the result being that a small number of trades (6 in fact) were technically submitted after the deadline time. Hockey Canada moved to an exact time (7 p.m. ET) while the CJHL moved to a 6 p.m. ET trade deadline across Canada in an effort to produce more competitive fairness nationally. Due to no fault of their own, a small number of teams within the OJHL and a much larger number of teams under the OHA footprint submitted trades after the cut down timelines, which were erroneously approved based on the old timing standards. The OHF and CJHL have each applied stringent sanctions against the OJHL impacting its teams and players. While the OJHL does not agree with the sanctions imposed, the league has exhausted all avenues of appeals available to it on this matter and is taking steps to mitigate against an issue of this nature arising in the future.